Specifications: 5.5-inch IPS LCD (2560 x 1440 pixels), Qualcomm Snapdragon 835 processor, 6GB RAM, 128GB storage (expandable), hybrid dual SIM, 12MP primary camera with OIS, 16MP front camera, 4G with VoLTE, dual band WiFi ac, Bluetooth 4.2, NFC, fingerprint scanner, dual speakers, IP67 certified, USB Type-C, Android 7.0, 3,000mAh battery, 169 grams. HTC’s U series of smartphones (U Ultra and U Play), did not receive a favourable response, which we think was due to the steep pricing. Now it seems that someone at HTC has had a change of heart. 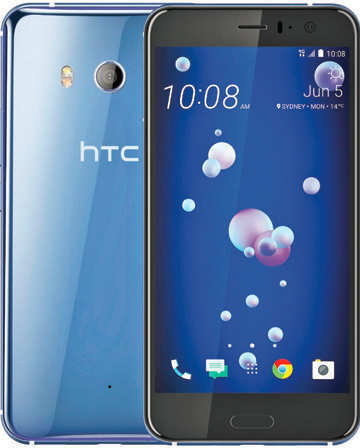 This is probably why the recently launched HTC U11 — their latest flagship smartphone — is priced at an aggressive Rs 51,990. With the U11, HTC continues with the ‘liquid glass’ surface design that we saw on the earlier U series devices. It has a mirror-like surface which gives the phone different hues depending on the ambient light. Obviously, this also makes it prone to fingerprints and smudges. You will need to use it with a case and helpfully, HTC provides a transparent soft case in the box. The rear has a slight curve which makes it comfortable to hold and at 169 grams, the U11 feels well balanced. The 3.5mm jack is gone (much to our chagrin) but HTC does provide a USB type C to 3.5mm adapter in the box. One of the headlining features on this HTC flagship is ‘Edge Sense’. The phone has a pressure sensitive frame (the bottom half on both sides) that can be setup to perform a function when you ‘squeeze’ the phone. This works even if the phone is locked. You can change how hard you need to squeeze it for the action. Set it too light and it might trigger when you normally hold the phone. Too hard and you’ll need your full grip strength. Using this squeeze function, you can choose to launch the camera, take a screenshot, turn on the flashlight and so on. In advanced mode, you can set one function for a short squeeze and another for squeeze and hold. It sounds like a gimmick but it works really well once you identify the squeeze force level comfortable for you. Kudos to HTC for this perfect implementation of a new method of interaction with a smartphone. Up front is a 5.5-inch 2k display (super LCD 5) with slim bezels, excellent brightness and vivid colours. As is usual with HTC devices, the screen is great for watching videos, browsing the web, reading text as well as playing games. Even though this is protected by Gorilla Glass 5, we recommend you get a screen protector from the start. Under the screen is the physical home button with integrated fingerprint scanner, flanked by the recent/back buttons. The fingerprint scanner is one of the best we have used — works from any angle and unlocked the phone 10 out of 10 times in our usage. The U11 is a powerhouse in specifications – you get the top-of-the-line Qualcomm Snapdragon 835 processor, 6GB RAM and 128GB internal storage. It runs HTC’s Sense UI based on the latest Android 7.1. As for benchmarks, it performs at par with the OnePlus 5’s 8GB variant — this is one of the fastest Android phones around. Needless to say, it will deliver seamless performance with real world usage. We faced no issues in playing any game, 4k video, running multiple apps (over 30 apps simultaneously) and switching between them. The battery back up from 3,000mAh battery was as expected too — a full day with normal use. With heavy usage, you might have to charge the phone by the evening. Thankfully it supports QuickCharge 3.0 and HTC bundled a QC 3.0 adapter in the box. With the supplied cable and charger, it goes from 10% to 75% in an hour. Camera test specialists DxOMark have given the HTC U11’s camera a score of 90 — the highest awarded to any smartphone till date. The U11 has a 12MP rear camera with OIS, f1.7, phase and laser autofocus — all of these combined deliver stellar results. Daylight, indoors or lowlight: it does not matter with the U11. It consistently delivers crisp photos with good details and rich colour. On the software front, there is a pro mode (with RAW format support), panorama mode and auto mode for photos while for videos you get normal, hyperlapse and slow motion. Video recording quality is also best in class along with 3D audio recording, courtesy the 4 microphones. With the ‘acoustic focus’ audio feature, you can zoom in on a particular audio source while recording video (to record audio from only that source instead of 360-degree sound). In our opinion, the HTC U11’s camera stands neck and neck with our current favorites: SamsungS8/S8+, iPhone 7 Plus and Google Pixel. The front wide angle 16MP camera is no slouch either — the image quality is fantastic with minimal noise. There are several other features on the HTC U11 that deserve mention. The loud dual loudspeaker output, IP67 certification for water and dust resistance, support for Google Assistant, HTC Sense Companion, bundled USonic headphones with active noise cancellation and up to 2TB storage expansion support. These features make the U11 stand out from the current crop. It doesn’t have an IR emitter though — would have been a welcome addition. The aggressive pricing is a sensible move from HTC. At Rs 51,990, this is a flagship well worth the money. Yes, the OnePlus 5 does offer better specifications (you can get 8GB RAM for `37,999), but the HTC U11 has a number of advantages. With the Samsung Galaxy S8 still priced at Rs 57,900 (4GB RAM, 64GB storage), the HTC U11 has no other competition. We highly recommend it to anyone looking for a flagship device.